I was born in 1955 in West Dakota, where I enjoyed a very privileged childhood growing up in an agricultural community with a population of about 4,000. 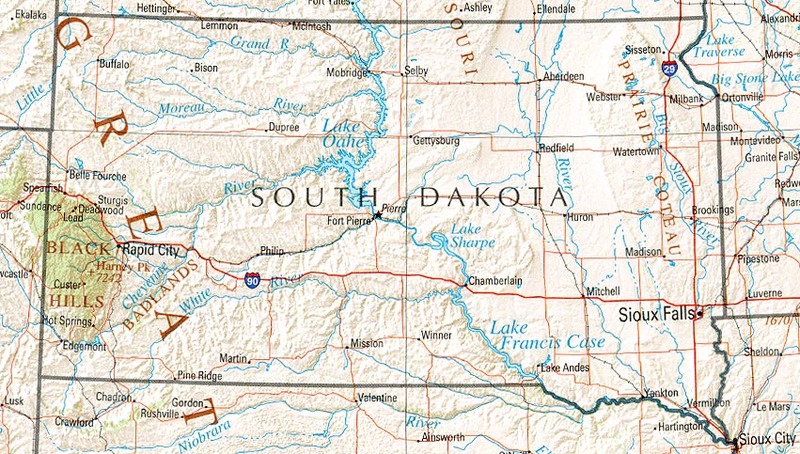 (South Dakotans apply the name “west river country” to the more arid and less densely settled region west of the Missouri river. I coined the term West Dakota.) Though I knew West Dakota was a special place, I didn’t realize how privileged I was until I left home. A long time ago, two frontier communities fought over a railroad. The railroad was routed through my hometown, which was named Winner. Winner is the county seat of two counties (Tripp and Todd), yet the population has fallen to about 3,000. I don’t believe trains run through Winner any more, though they did when I was a kid. We used to put pennies on the railroad tracks and let passing trains squish them into thin copper wafers. The center of my universe was my grandma’s farm, located not far from the virtual ghost towns of Clearfield and Keyapaha and very near the Dorian Buttes, about thirty miles southwest of Winner. It’s amazing how little information about the Dorian Buttes there is on the Internet; I couldn’t even find a picture. a gravel road runs between these imposing twin monoliths, which are far more deserving of the name Tetons than the famous Wyoming mountain range. From the top of the buttes, one can get an eagle’s view of the Great Plains, stretching away in all directions. From the summit, fences are invisible, and the black dots that represent cattle could just as well be bison. Lewis and Clark might have enjoyed similar views as they followed the Missouri River across the Dakotas and into Montana. Strangely, these epic blizzards are very rare nowadays. Perhaps they’re a victim of global warming. Some of my fondest memories are of days spent on “the farm,” where I was able to hike across the prairie and indulge my passions, which were pretty much limited to an obsession with natural history, particularly animals. Although many people think of the Great Plains as part of the Great American Desert, it’s actually crawling with life. To put it in perspective, I backpacked in Washington State’s Olympic National Park when I was in the Navy and was stunned by the area’s apparent lifelessness. Of course, there was the forest, with countless moss-draped trees that would be considered giants in the Dakotas. But I saw virtually no animals and didn’t even hear many birds. The silence was eerie. West Dakota consists primarily of miles and miles of grassland, broken by occasional farms, shelterbelts, crops, blowouts, badlands and tourist traps. In contrast, singing birds and whirring grasshoppers are very familiar sounds in West Dakota. Jackrabbits and coyotes are characteristic species, with cottontails living closer to human habitations. Now that the bison, brown bear and wolf are locally extinct, the largest native mammal on the plains is the pronghorn (though you can see reintroduced bison and elk in the Black Hills). However, there are occasional reports of pumas, or mountain lions, in West Dakota. White-tailed deer followed white settlers and are common in areas where there are trees and grain fields; they replaced pronghorns where I lived. Tree squirrels occur in some communities where trees are more numerous. An even more exotic species is the ring-necked pheasant, introduced to America from China by George Washington, whose likeness graces the state’s most famous tourist attraction, Mt. Rushmore. Today, the pheasant is the official state bird of South Dakota, which is known as America’s pheasant capital. South Dakota is also home to that semi-mythical creature that has surprised countless tourists, the jackalope, also called an antelabbit, deerbunny, etc. The name jackalope derives from jackrabbit and antelope (pronghorn), though jackalopes are generally depicted with antlers, not horns. Though horned rabbits have long been a part of European lore, the American jackalope was apparently born in Wyoming. However, South Dakota’s Wall Drug has probably done more to promote jackalopes than any other institution. In a land largely devoid of trees, many animals live underground…or underwater. West Dakotan lakes and even the smallest dams and ponds are often swarming with tadpoles, salamanders, turtles, garter snakes and fishes. Driving along country roads — a thrilling experience after one has been stuck in a big city for a while — one occasionally sees badgers, which prey on abundant ground squirrels and other rodents. The authenticity of my grandmother’s farm was even certified by a nearby prairie dog town. During those days I captured countless animals, mostly reptiles and amphibians, to keep as pets. I once had a pet raccoon that even accompanied me on a hiking/camping trip one day. That night, we slept by a prairie dam, I in my sleeping bag, with Rocky above me in a tree. I was wakened by a very strong wind and, in the darkness, imagined that a tornado was bearing down on us. It was too dark to see Rocky, but it didn’t matter — he had crawled inside my sleeping bag. I rolled it up with Rocky inside and ran for home, a mile or two away. West Dakota is known as a land of open spaces (miles and miles of miles and miles, as some locals joke), and they aren’t limited to horizontal spaces. though there are mountains here in the Pacific Northwest that dwarf the Great Plains’ tallest buttes, one often can’t seem them (or the forests that surround them) for the trees. The sheer vastness and emptiness of the Great Plains can be a little frightening for the refugees from the urban wilderness who pass through South Dakota en route to America’s vacationlands each summer. The sky is the abode of many of the forces that most terrorize Dakotans as well. I recall hiding in my grandmother’s cellar one time during a tornado scare, though all that materialized was a minor flash flood. I’ve never actually seen a tornado, even though my home town has been hit a time or two. But I did experience some exciting thunderstorms and hail storms. Though the latter are often ruinous to farmers, they offer an excuse to make home made ice cream, a Great Plains specialty that rivals Wall Drug’s free ice water, using freshly fallen ice as the chilling agent. However, the premier South Dakota food is sweet corn. When my father ran a gas station, local farmers used to give him big boxes filled with enormous ears of corn that make the best corn I’ve ever seen on the West Coast look anemic. (in fact, I very seldom eat sweet corn here in Seattle.) I think of sweet corn as the earthly incarnation of the sun. Sweet corn and pheasant is one of my favorite meals, though I haven’t eaten it in years. Far from bright city lights, one can actually see stars in the West Dakota night sky. I was visiting home some years ago when the Missouri River was experiencing record floods. I sat on a farmhouse porch one night, viewing one of the most astounding light shows I’ve ever seen, matched only by Alaska’s Northern Lights. The sky was filled with glittering stars, interrupted by an occasional falling star or satellite, which were in turn wiped out by periodic flashes of lightning. But even fireflies have competition in West Dakota. I recall swarms of enormous dragonflies hovering over our backyard during lazy summer days, searching for tiny prey. If I threw a tiny pebble into the air, a dragonfly would often break away from its colleagues to chase it. Cicadas were a huge mystery that took me years to unravel. As residents of the South know, these insects are LOUD. I can’t describe the sound they make; I suppose you could call it a pulsating droning sound. Eventually, I learned where the sound came from — huge insects perched high in trees. From a distance, they look kind of like giant armored house flies. If you disturb them, they instantly become silent as they zoom away to another tree. One day I caught one — and dropped it in fear as its body began vibrating, blasting me with that powerful sound. Years later, I discovered what I would have then described as shed insect skins on the lawn of the local post office. Still later, I learned that cicadas hatch in large numbers every thirteen or seventeen years. I also remember a very special pond near the hospital. More than a pond, it was one of the most magical bodies of water I’ve ever seen. Jumping on a tiny raft I spotted at the water’s edge, I poled out into the middle of the pond one summer day. The water was filled with life, almost all of it miniaturized — tiny salamanders, frogs and tadpoles, turtles, garter snakes and aquatic insects. I was saddened to learn that the pond no longer exists, its loss a stunning tragedy for children who now live in the area. It’s sad to think that future generations of children will never get to see many of Nature’s tiny miracles. Some of my fondest memories of West Dakota feature cumulus clouds billowing high above hawks soaring overhead above cattle, horses, jackrabbits, prairie dogs and bluebonnets. most of my favorite sounds were made by flying creatures, including mourning doves cooing in the twilight hours, crowing pheasants, meadowlarks, that weird sound nighthawks make when diving and the deafening drone that only a cicada can produce. And, of course, thunder. My favorite smells include prairie grasses just after a rain. West Dakota was a very special place socially, too. Like all special places, one doesn’t fully appreciate just how special it is until after moving away — or after that special place changes. More about that later. People sometimes joke that farmers plant trees by their mailboxes so they can sit in the shade while waiting for their welfare checks to arrive. But farmers also rank among America’s hardest and freest workers. They often build their own homes, dig their own wells, put up miles of fences and tend to their crops and livestock, working in grueling heat in summer and temperatures as low as -20° in winter. I bet very few Seattleites could survive just one week on a West Dakota farm in winter. Where I come from, many farmers dress like cowboys, though there are probably no true cowboys left in the Dakotas, having been pretty much eliminated by barbed wire and modern transportation. Of course, just about anything in the Dakotas that’s more than a mile from the Interstate can be considered isolated. Dakotans in general are conservative, and farmers tend to be especially suspicious of outsiders, which include “city slickers,” minorities and the government. The Indian wars more or less ended in South Dakota with the wounded Knee Massacre, but they are hardly forgotten. There’s a noticeable streak of racism in many South Dakotans, an attitude that was fanned and exploited by Governor Bill Janklow, one of America’s most reviled state governors — yet South Dakota’s most popular governor ever. This combination of conservatism and xenophobia fueled many stories of cowboys beating up people they regarded as hippies and sometimes cutting their hair during the turbulent 1960s. I had no interest in politics when I was young and was a little too young to get caught up in the giddy social revolution that characterized the 1960s. of course, West Dakota was far removed from the major action, anyway. I have more to say about South Dakota’s dark side on my political website. but rather than ending on a sour note, let me add that not all Dakotans are racist. On the contrary, white Dakotans and the Dakota people (Native Americans) alike inherited a bad and often complex situation, one that is exploited by Republicans just as Democrats exploit racism here in liberal Seattle. In fact, the Seattle school district is probably just as racist as any institution in South Dakota. When I was young, I had a love-hate relationship with West Dakota. I loved the farm, the prairie and the sky. But I wanted to experience it in the wilderness state that disappeared so very recently. Summer vacations to the Black Hills only whetted my appetite for even bigger, more pristine wilderness areas. My obsession was to escape the fences and the oppressive heat of West Dakota for the majestic, cooler mountains of the West. Better yet, I wanted to spend my life in the wilderness of the Far North. Eventually, I would spend nearly a decade working as a wildlife biologist in Alaska, visiting the four corners of that vast wilderness. It was a wonderful experience, yet something was missing. After being stuck in Seattle, with its disgusting corruption and corporate atmosphere, for years, it isn’t Alaska I dream about. Instead, I find myself almost irresistibly drawn back to West Dakota, with its heady combination of roots, rural sociability, breathing space and organic ambience. The movie Interstellar hit me like a bullet between the eyes; it was a movie about a space cowboy trying desperately to navigate both space and time in an effort to return home to his beloved farm and his loved ones. Though incredibly sad, the movie also gave me hope. Perhaps some day, I’ll discover a black hole or a wormhole that can take me back to the place I belong. During one of my last visits back home, I drove out past the Dorian Buttes to the farm, which was now deserted. In fact, the entire area seemed like one big ghost town. I never saw another person during that trip. It was as if I had all of Tripp County — and perhaps the Nebraska sandhills beyond — to myself. Gone were the 4h clubs, the church socials and the dances at Clearfield. Gone, too, were the cattle drives and the rodeos, along with the country schools. Or so I imagined. Of course, mine was but a short visit (in mid-winter), and not all rural South Dakotans have deserted their farms to make way for a “buffalo commons.” Indeed, the migration works both ways, with some city dwellers moving to West Dakota. Seattle itself is frighteningly corrupt, but I sometimes think West Dakota may offer solutions to some of the heady issues of our era. for example, when I taught school, I thought like a West Dakotan, treating children like children rather than market shares. Sometimes one has to experience a different environment or culture to really understand what makes home unique. A book titled Dakota: A Spiritual Geography taught me a few things, too. For example, I never knew there was anything odd about Dakotans’ appetite for Jell-O. Nor was I even aware of their inferiority complex. In fact, Dakotans often tease each other with light-hearted ethnic jokes featuring Bohemians, Pollocks and Scandinavians. but many Dakotans apparently feel a little intimidated by outsiders who are wealthier and more sophisticated. of course, the Great Depression left its mark on Dakotans’ psyches. Ironically, many Dakotans voted for George W. Bush, who plunged us into another Great Depression. But I’d like to end my recollections on a positive note: Sweet corn, pheasant and imported dark beer. That’s a meal I’d like to enjoy some day, on the summit of the Dorian Buttes. Or maybe I’ll just visit a nearby cattle tank and pump some of the world’s finest water out of the Oglala Aquifer. The finaly irony is the realization that I may be more spoiled than the yuppies I so despise.